For gourmets, Delhi is synonymous with Mughlai and Frontier cuisines. The best of Mughlai cuisine can be enjoyed at Karim, (both in Jama Masjid and Nizamuddin) where recipes, dating from the times of the Mughals have been the closely - guarded secret of generation of chefs. Delhi Ka Aangan (Hyatt Regency), Darbar (Ashoka Hotel) and Corbetts (Claridges) are among the many options available in the expensive range, while Gulati Restaurant (Pandara Market), Angeethi (Asiad Village) and Degchi (Regal Building) are among those catering to more modest budgets. The finest Frontier cuisine is available at the Bukhara (Maurya Sheraton), Frontier (Ashoka Hotel) and Baluchi (The Hilton). At the other end of the scale are many popular road side eateries around Jama Masjid and Nzamuddin where kababs, rotis and biryani are order of the day. Every five - star hotel in the city has a Chinese restaurant, while most markets in South Delhi have a medium - budget Chinese restaurants. The popularity of this cuisine can be gauged by the immumerable Chinese food outlets of the "meals- on - wheels" and kiosk variety. Pandara Road...... The growing sophistication Delhite's palate is discernable in the increasing number of speaciality restaurants- EI Arab (Regal Building), Dum Pukht or the process of slow cooking developed in Awadh (Maurya Sheraton), Kashmiri food at Chor Bizarre (Hotel Broadway), Thai food at Baan Thai (The Oberoi) and Sukothai (Hauz Khas Village), Japenese food at Tokyo (Ashoka Hotel) and Osaka (Hauz Khas Village), Tibetan food at eateries near Chanakya Theatre, and Mexican food at Rodeo (Connaught Place). Another indication is the frequency and popularity of food festivals organised by Hotels. South Indians food is another favorite, the vegetarian variety of which is best in enjoyed at Sagar (Defence Colony), Sagar Ratna (Lodhi Hotel) and Dasaprakash (Hotel Ambassador). Coconut Grove (Ashok Yatri Niwas) offers excellent non- vegeterian cuisine from South India. The best of continental cuisine can be eaten at five - star hotels, for instance La Rochelle (The Oberoi), The Orient Express (Taj Palace) and Captains Cabin (Taj Man Singh), though numerous multi - cuisine restaurants also offers continental food. Keeping pace with the changing face of the city are the growing number of fast food outlets which serve all manner of cuisines. A delightful outlet offering a range of Indian cuisines are the food stalls ar Dilli Haat, here, the cuisine of different states is made available at very moderate rates. Set in the mindset of a spacious crafts bazaar these cafes are a very pleasant place to enjoy food. For the more intrepid, eateries such as those at Paranthe wali gali, or chaat at Bengali Market and Sunder Nagar, bhelpuri at Greater Kailash and sweetmeats from Annapoorna and Ghantewala can be part of the gastronomical tour of Delhi. Delhi is also synonymous with the omnipresent tandoori chicken and tandoori roti, which, when freshly had from the tandoor, makes a delicious meal. This is often available at roadside dhabas at a moderate cost. Bread & More is the hippest eatery of the South Delhi. It serves exotic varieties of cakes, cookies and pastries, burgers, pizzas, hot dogs, sandwiches, chilled fresh-cream pastries, mousses and more.. Try it! you would love to visit this place once again. The best pastry shop in Vasant Kunj area is the Gourmet Shop. Here you will find cakes, pastries, pies, biscuits, puddings, fresh bakeries. The Gourmet Shop also offers an array of delicious creamy chocolates and oven-fresh breads. This is a landmark pastry shop opened in the year 1926, located in Connaught Place, Central Delhi. Wenger's offers delightful range of confectionaries with extensive variety of cakes and breads and much more. The Ano Tai provides some popular and some new dishes like Cantonese and Schezwan cuisine to lovers of Chinese food. Don't forget to try specialty items like Prawn Garlic, Dim Sum, Beijing Duck and Stir Fried Vegetables. Same as New York' most popular China Town this place in Hotel Ashok, too, has its distinguished identity and renowned for its great offering of authentic Chinese, Hunan, Szechwan and Cantonese dishes. The Hotel Park Royal InterContinental boasts some finest restaurants like Empress of China, which provide an incredible dining experience. It serves delicious Chinese cuisine, prepared by master chef Thomas Xing. Fortune Cookie located in The Centrestage Mall, Noida, the place is perfect for a good Chinese meal. It has become popular due to tasty food at reasonable prices. Jade is a popular chinese restaurant in the Claridges Hotel which serves Far Eastern cuisine, specializing in Thai and the foods from the Schezuan province of China. This contemporary Chinese restaurant is an exclusive experience in fine dining. Larry's China, the exotic restaurant of Taj Ambassador hotel located near the city's business and shopping districts.Here you can enjoy mouth-watering and exotic Chinese, Cantonese and Sichuan delicacies. You will find a good and charming selection of Chinese cuisine. So don't miss it. Lotus Garden is a cool chill out place which is located in Chanakyapuri. This place is perfect for a good Chinese meal and a reasonably-priced Chinese joint. Average meal for two person is Rs 600. Sampan is Delhi's premier Chinese restaurant with exquisite Chinese artefacts and décor. This roof-top celebration restaurant offers a fantastic view of the city. A live band-Black Slade plays everyday. It serves Cantonese and Szechwan platters for lunch and dinner. Shaolin is a Chinese restaurant which servers the Shanghai Shrimp Salad, Mushroom and Bamboo Shoots and Shark Fin's Soup. This is the perfect place for chinese food lovers. You can also enjoy here a melodious music. Oberoi hotel houses some of finest award-winning restaurants, which provide an incredible dining experience. One of them is Taipan, an exclusive Chinese restaurant where you can have almost all the Chinese delicacies in the purest forms. Taste of China located in the heart of the national capital of Delhi in the exclusive Connaught Place area. It serves exotic varieties of Chinese cuisine. Quite popular for its reasonably priced menu it draws a huge crowd food lovers to CP. A Chinese restaurant and Dim Sum teahouse, set in an exotic lobby near pond with a beautiful bridge where you can savour mouth-watering chinese delicacies with tasty wines. This restaurant of bamboo grove will definitely become a favourite place after your first visit. Woks is a speciality restaurant, serving delicious Malay-Chinese cuisine in a very exotic ambience and decor. Here you can have authentic Dim Sums and other Chinese dishes, which will leave an unforgettable experience on your palates. Bernardo's is a Coastal Food Restaurant located in Gurgaon. It offers an array of exotic coastal food. This is the perfect place for Coastal Food lovers. Try it! Definitely you would love to visit here once again. Located in New Friends Colony, Seven is an exotic restaurant of Crown Plaza Hotel, specializing in coastal food. Fine dining Indian restaurant showcasing seven different styles of Indian cooking under one roof. You can enjoy here with live ghazal programs. Le Belvedere is a unique nightclubs providing the perfect place for dining and dancing in the city. It serves Continental & Indian cuisine during the buffet lunch and from the a-la-carte menu for dinner. Adjoining the Le Belvedere is a ‘Henri’s Bar which serves a range of wines and cocktails. The Taj Palace boasts some of the finest restaurant, one of them is Orient Express, the city's most stylish and expensive restaurant that has won the best European restaurant award for five years in succession. You must try it. 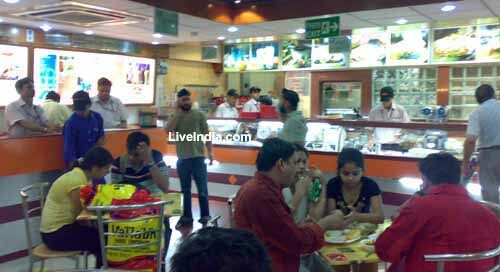 Delhi's one of the most popular fast food restaurant is Kent's Fast Food which is located in Kalkaji Main Market. Try its food once a time, definitely you would come to again. There are few restaurants that serves the Greek Cuisine. One of them is Its Greek to Me located in Safdarjung Enclave. Great food and nice decor, complete with the Greek tradition of breaking plates at the end of the meal. Top Of The Village is an open sky restaurant at the rooftop in Haus Khas Area. From the Top of the Village restaurant, you can enjoy the magnificent view of Shah Feroz's tomb. The glowing lights on the tomb adds flavor to the delicacies during night and makes a memorable horizon to dinner. There are many restaurant in the Hotel Regency but La Piazza is a most popular restaurant serving authentic Italian cuisine and the best pizzas. Its rustic surroundings are reminiscent of the sidewalk restaurants and meeting squares of Italy. In a quiet corner of The Imperial Hotel, Delhi, stands San Gimignano, a new 28-cover restaurant that offers Italian food in elegant surroundings. The restaurant leads into a terrace courtyard called Paradiso DiVino. Launched in association with hotel hassler in Rome, Travertino provides a fine dining experience with classical italian cuisine. It also serves an extensive Italian wine selection from the Enoteca wine cellar. One of the finest Italian restaurants that caters for all tastes, serving up a selection of contemporary and traditional Indian or Continental dishes with unique décor and comfortable sitting arrangements. The views overlooking the gardens from the restaurant would complement any meal. You must try. Located on Nelson Mandela Road, Enoki is a country style Japanese restaurant where you can relish on genuine Yakitori recipes. A good varieties of Sake, Japanese rice wines are also available at Enoki. Average meal for two: Rs 2000. If you want Japanese cuisine, choose the Sakura restaurant. It is India's best award winning Japanese Restaurant. Try the Sushi Platter or the raw sliced fish Sashmi and veggies can try Veg Tempura. Teppanyaki Kitchens, or better known as simply TK, has seven grills behind a transparent screen through which you can have visual experience of culinary delights and haute cuisines. Besides the best Teppanyaki grills, you can have Chinese, Mongolian, Korean and Thai food. The Curzon Room restaurant named after the British Lord Curzon which serves an excellent buffet at lunch and dinner. It offers a mouth-watering variety of vegetarian and non-vegetarian northern Indian dishes. The first & the authentic Mexican, Tex-Mex restaurant in Delhi, Rodeo Chefs perfect in their culinary skills give you a taste of Texas & Mexico. Located at International Trade Tower, Nehru Place, South Delhi, Casablanca is an authentic Mediterranean food restaurant. It can be booked for private parties, kitty parties and corporate bookings. The famous mediterranean cuisine restaurant located in the posh area of South Extension, New Delhi. Happy Hours of the restaurant are 12 - 7.30pm. Olive Bar and Kitchen is a fine dining restaurant located at Mehrauli. This restaurant has rated world best new restaurant in 2004 by Conde Nast Traveler. Now it has become popular due to tasty food at reasonable prices. Dum Pukht is a great speciality restaurant dedicated to a 200-year old culinary tradition of slow cooking food, in sealed'deghs'. The fragrance of the meal becomes an invitation befitting royalty. Dum Pukht is the winner of Asia’s first "Golden Fork" award. Haveli, the stylish and traditional indian restaurant at the Taj Mahal restaurant located at Man Singh Road. Some of the must try dishes in Haveli are Raan-E-Haveli, Bhatti Ka Murg, the Maharaja and Maharani Thalis for Rs 1095/995. Art Junction, as the name suggests, is a 30-seater restaurant for light meals and snacks. This artistically decorated cafeteria near the swimming pool is the best & cool place to enjoy a refreshing breakfast and to start your day in good mood. At 'Chef & I', you can have a wonderful interactive experience while savouring delightful Pan-Asian food and wine. There are no waiters or back kitchens in this restaurants. The Chef directly interacts with you to take the order and explains what goes into the making of a dish. The restro-bar at the Taj Hotel, known as H2O+ is most popular for its underwater décor and innovative cuisine. Must try Falafal, Kaju sprinkled vegetables and grilled prawns. The traditional Indian restaurant at the hotel Imperial is built in 1911. The hotel is really quite modern with all the latest facilities. Really very beautiful, service is excellent and the restaurant overlooks a well manicured lawn, which is refreshing after the concrete streets of Delhi. An exotic chill out place is located in Connaught Place, Central Delhi. Music, masti and fun is the spirit of this place. If you are a lover of multi cuisine, this is the perfect place. So Hurry Up. "QBA features a lighter Lounge menu served at a super sonic spread and pegged at a price thats finance friendly. "Qba's dinner platter pampers you with appetizers like aromatic and fresh breads served with two flavors of humus, smoked lamb, cream cheese and beet root. Delhi's most popular dining spot is the Pavilion. This newly furnished multi-cuisine restaurant offers a very lavish buffet. The Fish Ahoy and Maggi’s farm fresh vegetables are a must try. Known as the worlds best North-West Frontier cuisine restaurant, is set amidst a charming ambience. It is opened in 1978 in the lobby of the ITC Hotel Maurya. Sheraton & Towers, New Delhi. As the name suggest, it stands on the frontier of the restaurants, offering tasty barbequed dishes. It serves delightful fare from the northern parts of the subcontinent. Average meal for two: Rs.1200. 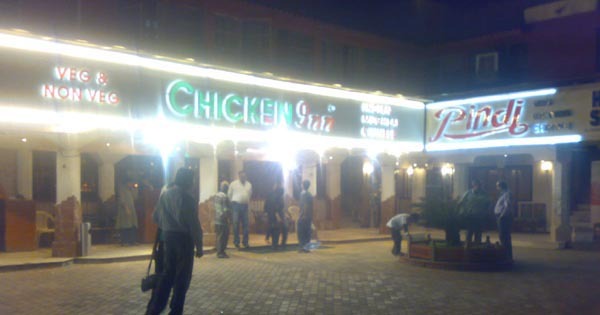 Lazeez Affaire is an excellent, upmarket restaurant, which attracts a smart, well-heeled clientele. The menu is imaginative and the food carefully cooked - the kakori kebab, the murg hyderabadi and the stuffed tomato are particularly recommended. Do try the Handi Meat. Pakwan is an excellent spot of Le Meridien with an ethnic Indian ambience specializes in North - West Frontier cuisine and has a perfect setting with live Ghazals. It offers the Navratra special menu for lunch and dinner. The menu includes an array of traditional Navratra specialities, prepared without use of onions and garlic. This restaurant is located in the middle of a lush green dear park, near the entrance to Hauz Khas Village. Here you can enjoy the authentic North West Frontier delicacies in a beautiful ambience and great seating arrangement. The Haryali Choosa, Murgh Potli and Lababi Shola are must try dishes. Designed by Rohit Bal, Veda restaurant serves a tasting menu for vegetarians and non-vegetarians, the Platters are priced at Rs 975 and Rs 1175 respectively. As the name indicates, here you can have the choicest Pan-Asian delicacies. Serving Pan-Asian food, this restaurant houses a seated capacity of 110 for lunch and dinner with an additional bar capacity of 200. It is a favorite place for tourists, who want to experience Asian foods. An exotic nicely decorated and simple restaurant in Connaught Place, Central Delhi, The Host is popular for Pan Asian cuisine. Average meal for two: Rs.800. Agni, in The Park Hotel is widely known as the best place for Punjabi food specialties in Delhi. The 35-foot long stylish bar is designed by Conran and Partners from London which offers a very push ambiance. Relax in leather chair and enjoy refreshing drinks amidst charming people. Angan, a popular restaurant in Hotel Hyatt Regency, serves the most authentic Indian foods. Here you will find a lot of Indian food even as the chef experiments with fusion food. The Kebab platter and non-veg thali are a good way to sample everything. A 95 seater restaurant, Baluchi is very popular with the tourists serving the delicious Indian cuisine. The design and décor of this restaurant is simply superb and taste of the food outstanding. You can enjoy here a magical evening with delicious food and live Indian music. Baujee Ka Dhaba restaurant located at Hauz Khas Village which spread over 3,000 sq. ft. area. You can try the Murgh Makhni, Saag Gosht Salan and zeera matar. It is opened 12 - 3.30 pm, 7 pm - 11.30 pm. Average meal for two: Rs 600-800. Attached to The Grand Hotel, Careway offers the traditional aromatic tandoori cuisine prepared in dramatically displayed tandoor ovens. If you want to tickle your palate with delicious tandoori dishes, Caraway is the right place for it. The Dal Caraway, Makai Palak, the kebabs and Raan are must try dishes. Adjoining the nightclub Agni, the new Indian restaurant is sure to ignite you with its fusion dishes like Keema Risotto, Haleem, Bengal Mustard Cauliflower, Roast Duck masala. It is opened 12:30 pm-3 pm and 7:30-12:30 am and Average meal for two: Rs 1000. The Kandahar, in the Oebroi Hotel offers an eclectic cuisine reflecting the rich flavors of North India, robustness of the Frontier, street savvy and lip-smacking deliciousness of the streets of Delhi and the simplicity of home-style Ghar-Ka-Khana. 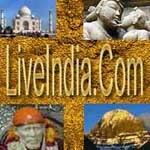 Enjoy here with live ghazal programs and popular Indian music. Masala Art in the Taj Palace Hotel, is widely known as the best place for Northern Indian cuisine. Here you will find modern décor, display kitchen and traditional Indian delicacies on the menu. The must try dishes are Gilouti Kebab, Khushk Raan, Katliyan aloo. If you are a fan of typical south Indian food, Dakshin is the best place for it. The most popular dishes are Chicken Chettinad, Prawn Curry and Dry Mutton. Here you can have a wide range of South Indian foods in a perfect setting. 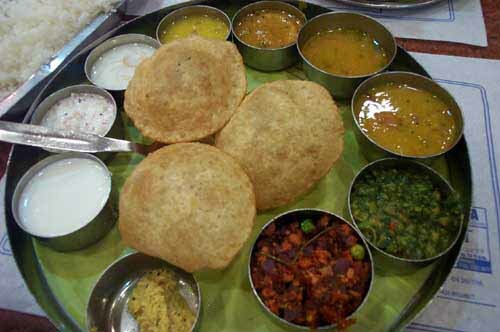 Located in Chankyapuri, South Delhi, Sagar Ratna is a specialty vegetarian south Indian restaurant. Here you can try all types of dosas, idlis, dahi vadas. Also try the paper or paneer dosas, uttapam, coconut rice and more. Or simply order the veg thali for Rs 145. South Indian Restaurant is located in Karol Bagh, New Delhi and specialises in southern cuisine. The cooks are specially brought from south India to create the authentic south Indian flavour.